BARNEY OLDFIELD IN THE 1909 CHRISTIE KICKING UP DIRT. NOTE THE PUFFS OF EXHAUST FROM THE TWO CYLINDERS ON THE STARBOARD SIDE. Some great Christie photos and information from Enrique J. Klein, Christie expert who has researched them extensively. Thank you Enrique. This was the last and most advanced of Christie’s Front Wheel Drive race cars that starts with the 1904 prototype, built and patented in 1904 by J. Walter Christie. He was without a doubt the pioneer in the development of the front wheel drive automobile. His 1909 racer had a four-cylinder engine with pistons 7 1/2 inches in diameter with a 7 inch stroke, which displaced 1,237 cubic inches! His engine, mounted between the front driving wheels had steeply slanted pistons with 30 1/2 inch connecting rods to achieve better weight distribution between front and rear than his earlier designs. 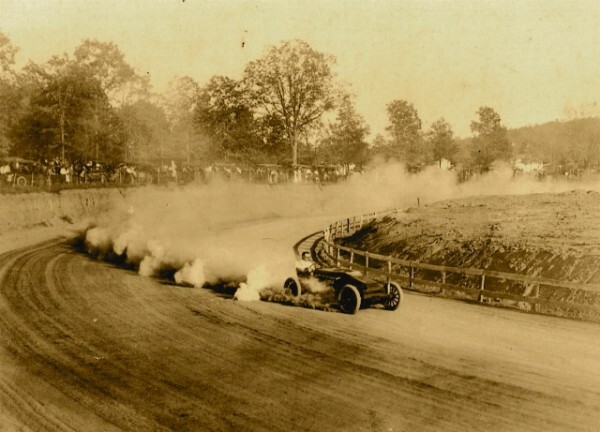 The racer had been clocked at 113 mph in 1909 and later, in the hands of Barney Oldfield, achieved the distinction of being the first car to run a lap around the Indianapolis Oval at over 100 mph. CHRISTIE’S LAST RACE CAR AS WRITTEN UP IN “THE AUTOMOBILE” IN THE AUGUST 5, 1909 ISSUE. A CROSS SECTION OF THE MACHINE SHOWING THE EXTREME SLANT OF THE PISTONS AND VALVE TRAIN. If the front axle was also the crankshaft how did they arrange clutch disengagement and steering? Walter Christie put a clutch on each end of the crankshaft, and he connected the 2 clutches with a mechanical linkage to one of the levers on the drivers right side. So he went into top gear when engaging those two clutches. This worked OK because his huge engines turned less than 1000rpm, which works out to around 100mph at 1000rpm in direct drive. Christie did have a low speed gear and reverse gear which went through a differential and back to the wheels with those main clutches disengaged. It’s complex, but spelled out in his patent.